Confession: I'm moderately obsessed with mason jar salads, spiralized veggies, plant-based protein, homemade dressing, and Silk almondmilk. All of these play a role in today's recipe! And... Silk Almondmilk helps me be my best, happiest self. When your body is nourished with good-for-you things, it blooms. And you feel stronger, and more motivated, and like no matter how big the obstacle, you can overcome it! 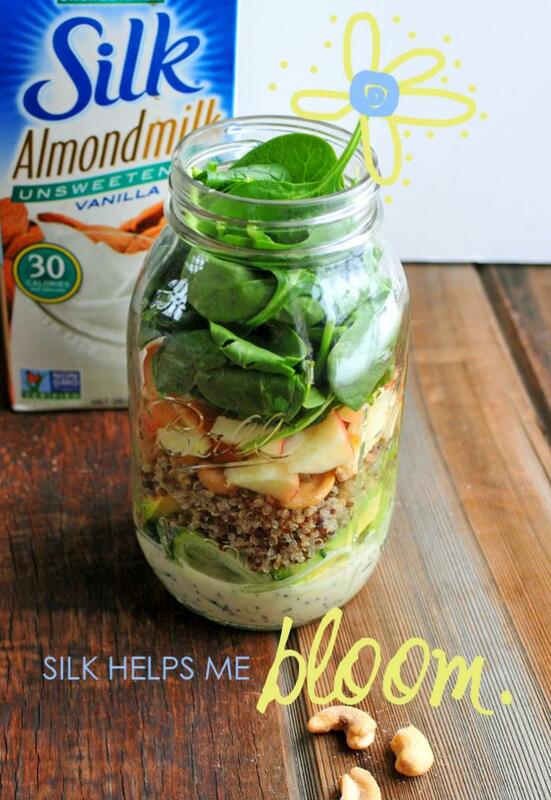 Switching to Silk is a great (easy) way to start adding more plants to your diet, not to mention what you're combining it with --- in a smoothie with spinach and blueberries, as a main ingredient in salad dressing with cucumbers and cashews, in mac & cheese with super greens and flax, or in a dreamy coconut quinoa bowl with mango and pistachios... the (delicious) possibilities are endless! 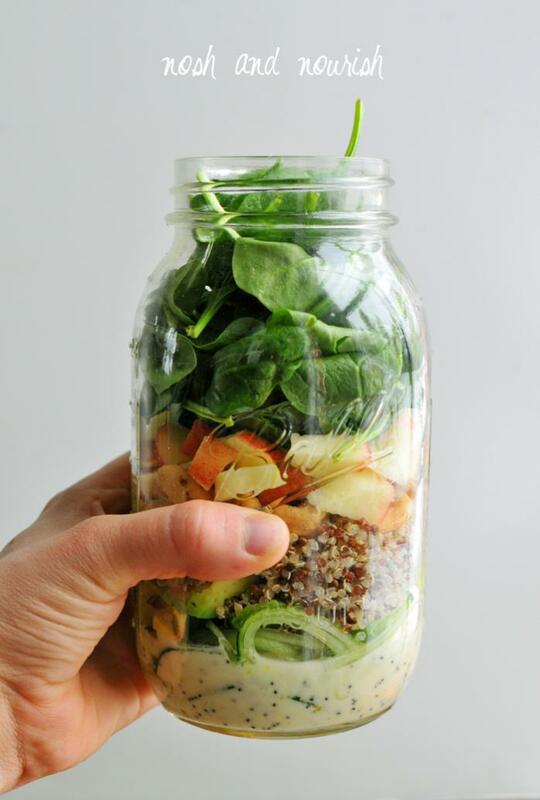 Mason jar salads aren't just pretty. They're purposefully layered to keep everything crisp and fresh, with the heaviest and soggiest things on the bottom of the jar --- far far away from the greens. There's not much worse than wilty salad. OK, maybe there is -- a salad that leaves you hungry exactly 12 minutes later. 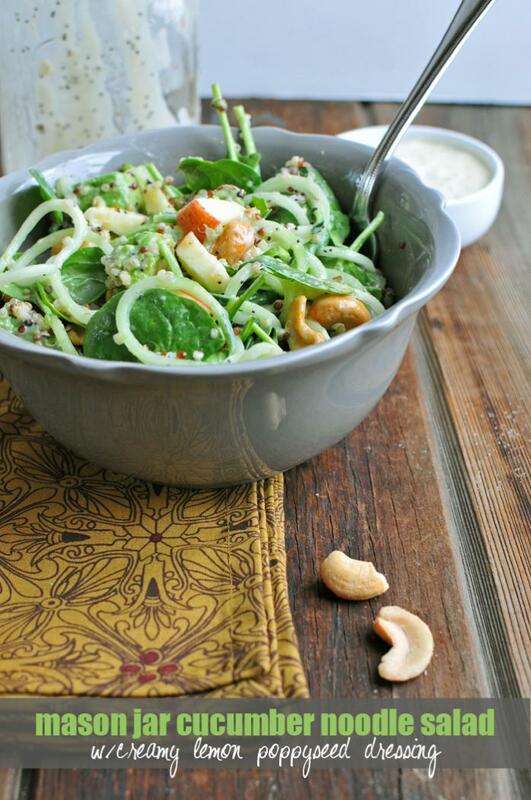 But this salad has a great combination of healthy fats and proteins to actually keep you full 'til dinner! When it's time to eat, empty out the contents of the mason jar into a large bowl and stir it all up. Gorgeous. Delicious. Sweet. Satisfying. I could seriously eat this salad all day every day... it's soooo good! Be sure to sign up for Silk's newsletter for coupons, recipe ideas, and even prizes. Combine the dressing ingredients (olive oil through poppy seeds) in a large measuring cup. Use an immersion stick blender to blend the mixture for approximately 1 - 2 minutes until it is thoroughly combined and thickens. This makes more dressing than you'll need for the one mason jar salad, so pour 1/4 cup of it into the bottom of the mason jar and then set aside the rest in the fridge for another time. 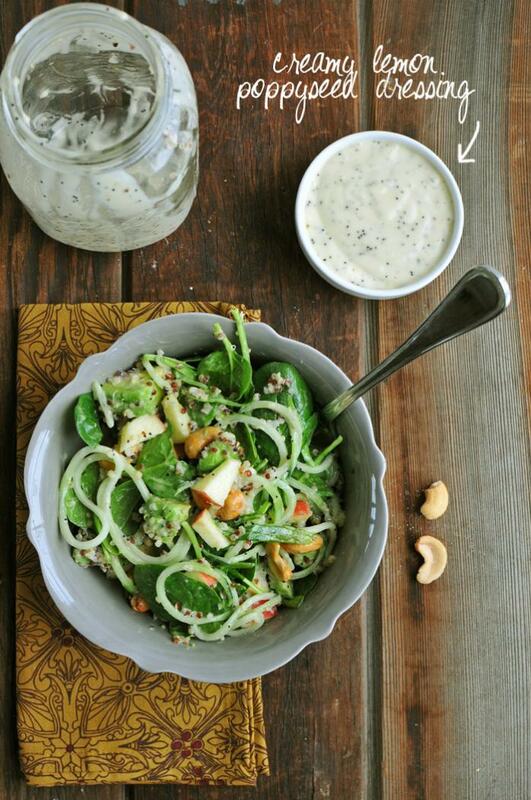 Assemble your mason jar salad: dressing in the bottom, then spiralized cucumber, quinoa, avocado, cashews, apples, and finally top it with the spinach. Make sure the jar is packed tightly. Put on your lid. When you're ready to eat, empty the contents of the mason jar into a large salad bowl. Stir, then devour.